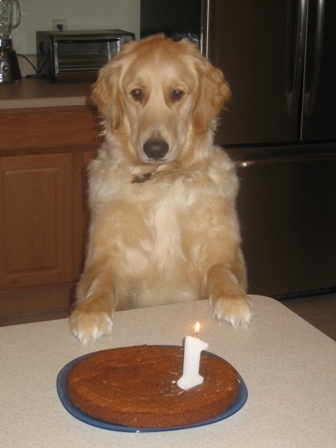 Home > Recipes by Category > Dog Treats > Happy 1st Birthday Einstein! Tomorrow marks Einstein’s 1st birthday, and I thought we would celebrate today by giving him a birthday cake to enjoy :) Einstein managed to inhale his piece of cake in under 3 seconds, so I think he was pleased with his first birthday cake. Mix flour and baking soda. Add remaining ingredients and mix together. Pour into greased 8″ (I used 9″) round cake pan and bake at 350 degree F for 30 minutes or until golden brown. Let cool. Puree cottage cheese or fat free cream cheese for icing. 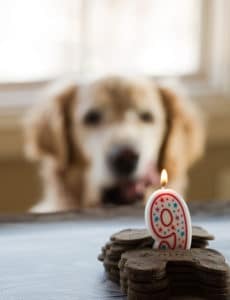 A birthday treat for your furry friend! Mix flour and baking soda. Add remaining ingredients and mix together. Pour into greased 8" (I used 9") round cake pan and bake at 350 degree F for 30 minutes or until golden brown. Let cool. Puree cottage cheese or fat free cream cheese for icing. Nutritional values are for the whole cake. « Previous PostHomemade Bread – There’s Nothin’ Better! Can I substitute coconut flour, brown rice flour, sweet rice flour or rice flour for whole wheat flour? Hi Caitlyn, I haven’t tried any of those subs, but I think they SHOULD work. The pictures of the dog sitting at the table are hilarious. It’s funny how they seem to have a personality all their own. 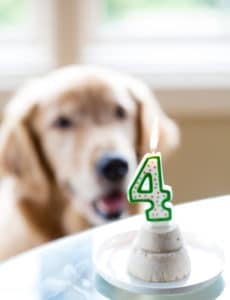 The dog bone recipe with only four ingredients is getting book marked. Thanks for the share! I am making this tomorrow for Gage’s 1st Birthday! It sounds delicious, I think I might have a slice lol. Thanks for the receipe! 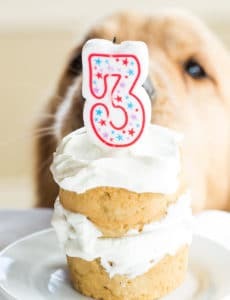 Making this for my pup today, its her 1st birthday and wanted to make a dog friendly cake/treat for her and her guests.